You’ve committed to setting a budget. Good for you! The trouble is, making that decision leads to a long, difficult list of other questions. What am I spending? What’s my real income? What are my goals? Most important of them all: Where the heck do I start? Crafting a sensible budget that fits your needs requires a little legwork. Here’s a helpful list of questions to ask as you begin your journey. Follow this guide and you’ll be headed down the road to better financial health no matter what your goal is. How are you going to keep track? To be successful, you need a process of accountability and consistency. Figure out what computer programs you’ll use to assist in tracking your dollars. I recommend You Need a Budget. There’s a $6.99 monthly fee, but the comprehensive suite of budgeting tools is powerful and fairly easy to navigate. Mint is popular and free but with fewer bells and whistles. I highly recommend Trim, an free tool that watches your accounts and alerts you to issues. With a little research, you might find another that works for you. Why do you want a budget? Determining your motivation informs the decisions you make. Looking to bolster your retirement funds? Concerned about overspending in certain areas? Thinking of upgrading your house? Dying to take a vacation? Itching to travel or backpack across Europe? Getting married? Starting a family? There’s no wrong answer. There might even be more than one. You just need to figure out what you are driving towards to make sure you get to the destination. What are your necessary expenses? It’s likely you’ll be able to come up with these easily. This list includes mortgage or rent, credit card bills, groceries, insurance and car payment. What are your irregular expenses? Even mindful money people tend to forget certain expenditures. How much do you really spend on Starbucks? Do you go to the movies more than you realize? A quick peek at your online bank and credit card statements can be eye-opening. Go through them with a fine-toothed comb to get a strong handle on where your budget can budge and where it can’t. You’ll never be certain about how much you’re making until you take stock. Include your wages, but don’t leave out investment income, child support or alimony, and anywhere else you are earning money (dog walking, a side gig or that illegal poker night you are running). To be successful, you need a process of accountability and consistency. This step takes the first question on this list and expands upon it. For example, you want to retire when you reach 65. Or, you’d like to set sail on that dream cruise two years for now. Take your motivations, and turn them into goals by making them specific. For some helpful perspective, check out this piece on SMART (specific, measurable, attainable, realistic and timely) goal setting. Time to drill down and determine how much you need to reach your goals. Say, how much will you need to save to retire comfortably? How much is your ideal house likely to cost? Or, what will tuition be at your kid’s chosen school when it’s time to enroll? Do you need to talk? If you’re the sole member of your household, there’s less need for a conversation. If you’re married, or living with kids or other family, it’s time to chat. The conversation topic: spending to reach your goals. Make sure everyone knows where to pull in the reins on those irregular expenses and determine together what is unnecessary. This doesn’t mean that you can’t have that Starbucks or new purse, but determine what is more important and worth giving up to reach that bigger goal. Further, ensure no one makes a big spend unless they check with others in the house. What kind of budgeting approach is best? There are many different tracks to take when working towards a budget. For example, the zero-sum philosophy dictates every dollar you take in has a home. That means whether you’re spending it on expenses, savings or discretionary stuff, you know where it’s going. A similar approach is 50/30/20--50% toward needs, 30% for things you want, and 20% to savings. No matter what your approach, you will need to evaluate your regular and irregular expenses and make some choices. Once you’ve answered all of the above questions, it’s time to take action and enter the numbers. 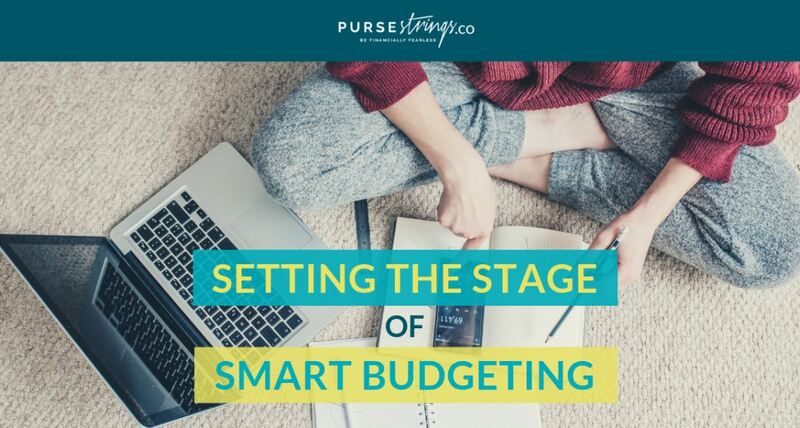 Budgeting isn’t by any means an easy process. It is, though, but necessary to achieve your dreams. Need a hand? Contact Purse Strings--we’d be happy to connect you with a Purse Strings Approved Professional who is an expert at walking women like you through the process.